Allegiance Capital represented SynAir Corporation, a world recognized compounder of polyurethane systems, and its sister company Chemical Innovations Limited, manufacturer of specialty chemical products. CIL manufactured and distributed Synair’s key product, the industrial puncture proofing system TyrFil, for the European market, as well as its own Cilbond range of rubber and polyurethane to substrate bonding systems. The companies were acquired by Hyperlast, a subsidiary of British Vita, now The Vita Group, a world-class producer of cellular foams, industrial polymers and engineered thermoplastic sheet, so that British Vita could expand into a US manufacturing presence. 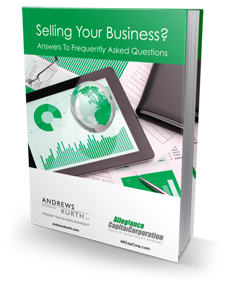 Complimentary eBook: Selling Your Business? Thinking about selling your business? Have questions? We want to answer your questions. Just sign up here to receive your complimentary ebook today. Allegiance Capital is widely recognized for attaining the highest levels of achievement amongst its peers within the finance and M&A communities. Our awards are a testament to the successes we have achieved for our clients. Please provide the correct answer to the math question. Complete the below form to subscribe our newsletters. All fields are required.